If you haven’t heard about bone broth’s healing powers we’re here to fill you in! Bone marrow and minerals, which you can access by simmering bones with water and vegetables for a long time in a stockpot or slow cooker, contain a multitude of health-boosting components. You’ll never regret keeping a tried-and-true bone broth recipe on hand for when you need a boost of energy, gut-healing collagen, or extra nutrition. We’ll share one of our favorite bone broth recipes with you, but first let’s discuss the amazing health benefits of bone broth. When you drink bone broth, whether homemade or by adding it to soups and other recipes, the slow cooking process is what draws out the healing nutrients. You’ll feed your body nutrients including collagen, marrow, amino acids, minerals, glycine, and gelatin, all of which can support optimal health. Here’s an overview of the specific health benefits bone broth provides. Collagen and gelatin have been shown to heal the gut lining — which is exactly what you need to heal leaky gut (1). By supporting your digestive tract with these nutrients, you can also heal and prevent other conditions that stem from compromised digestive health. Leaky gut it can lead to chronic illnesses, diseases, and respiratory allergies, since approximately 70% of immune system cells are found in the gut (2). Bone broth has been used around the world for centuries as a treatment for colds, coughs, and other health issues. Bone broth contains several essential vitamins and minerals in high concentrations, which makes it like a drinkable vitamin. One of these minerals is zinc, a powerful antioxidant, which is crucial for normal development and function of cells and has been shown to decrease infections (3). Bone broth is highly anti-inflammatory thanks to its amino acid profile. In addition to glycine, bone broth also contains proline, arginine, and glutamine, which all help reduce chronic inflammation (4)(5). You must prevent inflammation to prevent cardiovascular disease, age-related disease and other chronic illnesses (6). 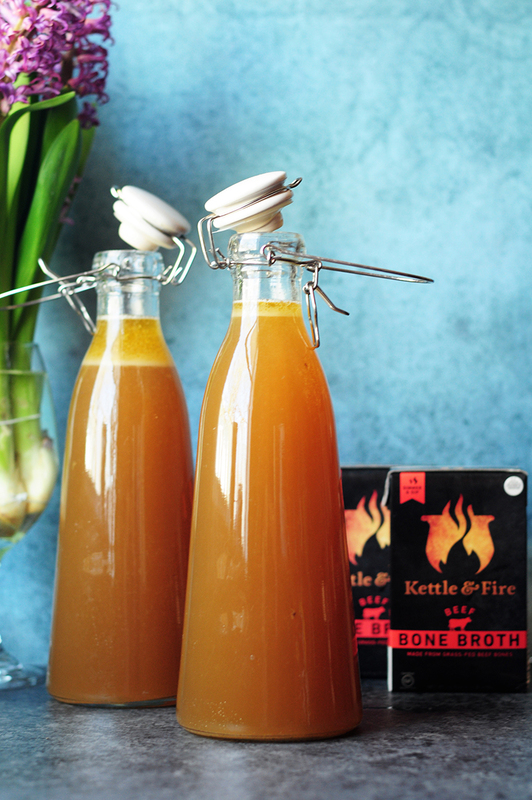 Bone broth’s anti-inflammatory properties may reduce the frequency and severity of joint pain flare-ups. The ligaments and connective tissue found in bone broth recipes provide large amounts of glucosamine and chondroitin, both of which have anti-inflammatory properties that help repair the skin and joints. Bone broth also contains collagen, which has immune-boosting properties and contains the amino acids proline and glycine, all of which are key to combating joint pain and speeding up injury recovery (7). Bone broth may be the perfect nighttime sleep elixir for a variety of reasons. It’s an essential source of magnesium, which synthesizes proteins, transmits nerve signals, and relaxes the muscles to support restful sleep (8). Magnesium supplements are not always easily digested, which is why bone broth provides a great solution for relaxing right before bed. It can also help you stay asleep due to the amino acid glycine, an inhibitory neurotransmitter in the brainstem and spinal cord (9). It’s the primary neurotransmitter that inhibits sleep cycle motor neurons during active sleep (10). Bone broth recipes can support weight loss, particularly when you implement a bone broth diet. This diet cuts out problematic foods that can lead to weight gain and impaired digestion, like grains, refined sugar, and legumes. A bone broth diet replaces these foods with high-quality animal proteins and vegetables, and can also be combined with intermittent fasting. Glowing skin is not only a result of the nutrients you eat, but how well you absorb them. You can’t absorb the nutrients you eat without having a healthy gut lining. Bone broth promotes optimal nutrient absorption, as the collagen and gelatin help heal and seal holes in the gut lining (11). A healthy gut allows your body to absorb the vitamins, minerals, essential fatty acids, and antioxidants you need for healthy skin. Collagen also plays a role in maintaining skin elasticity and preventing fine lines, wrinkles, and sagging skin (12). Forget your morning coffee! Thanks to its gut-healing properties, bone broth can also naturally increase your energy levels. By repairing the gut lining, you can improve your body’s ability to absorb the essential nutrients that are needed for energy production. Minerals such as calcium, magnesium, and phosphorus all play an important role in oxygen transport and energy production (13). Once the minerals are released, they’re highly bioavailable — which means they’re easy to absorb, even with an impaired digestive system. When we refer to bone broth and its benefits, we are not talking about the artificial broth powders that line your average grocery store shelf. These products contain zero nutritional value, and are often filled with questionable ingredients like MSG and artificial flavors. When we say bone broth, we’re talking about the real stuff: marrow-filled, collagen-packed, gelatin-rich, mineral-dense magic liquid. Bone broth is an acquired taste for some. If you’re new to drinking it, that first taste can come as a shock, especially if you’re used to a thin, salty soup stock. The good news is, you can learn to like it even if you don’t right away. The secret is teaching your taste buds that it’s not a bad thing. Add flavor with a dash of sea salt, black peppercorns, or bay leaves. You could also add it to an existing soup, or even mix into a smoothie! 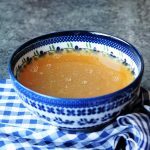 If you’d like to try making homemade bone broth, there are plenty of simple bone broth recipes. Here’s our tried and true beef bone broth recipe. 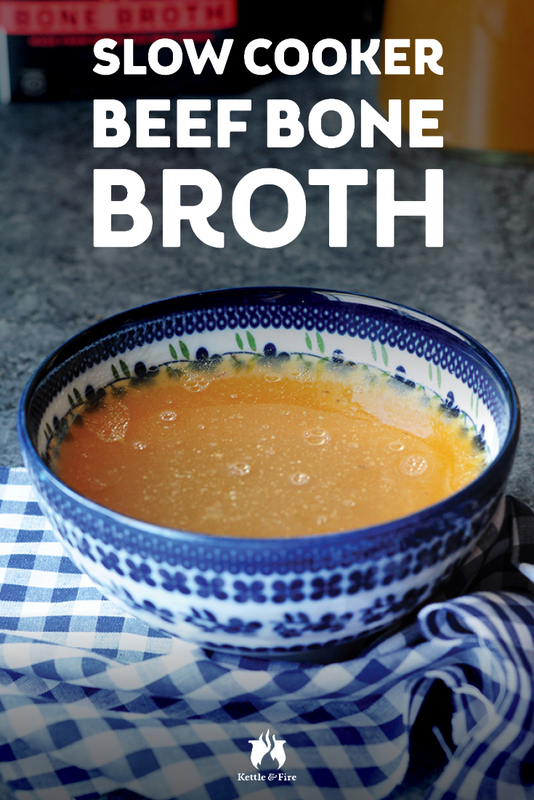 We recommend you use high-quality, grass-fed bones for the ultimate nutrient-rich broth. Roasting the bones before simmering them and tossing in some organic vegetables gives it even more flavor and nutrients. Feel free to add a dash of sea salt and black peppercorns for extra flavor before enjoying as well. The post Slow Cooker Beef Bone Broth Recipe appeared first on The Kettle & Fire Blog.